The Dow (DJIA) posted a net quarterly decline for the first time in nine quarters, falling over 2.3% in Q1 of 2018. The S&P 500 (SPX) mirrored the Dow’s performance, with a 1.2% quarterly fall, its first quarterly decline since Q1 of 2015. The streak of consecutive quarterly rallies for the Dow was its longest since 1997, and analysts have attributed the recent turbulence to a multitude of factors, including rising interest rates, trade war fears, political turmoil in Washington, and inflation concerns. Tesla (TSLA) posted its worst month in the company’s history, with shares plunging 22% in March. The electric car company suffered a barrage of bad news last week, causing shares to fall 12% last week alone. The National Transportation Safety Board (NTSB) announced it was investigating a March 23rd crash involving a Model X with its “Autopilot” mode turned on. Tesla also recalled 123,000 Model S vehicles, half of its cars on the road, due to a power steering issue. As if these problems weren’t bad enough, Moody’s downgraded Tesla’s corporate credit rating from an already-bad B2 to B3, downgraded its senior note and speculative grade liquidity ratings for the company, and lowered its outlook for Tesla from stable to negative. The downgrades sent Tesla’s bonds into freefall, with its 5.3% notes due in 2025 trading for 87 cents on the dollar. The flurry of negative news comes at a rather inopportune time for Tesla, which is still struggling to ramp up its Model 3 production and now faces an impending cash crunch. President Trump attacked Amazon repeatedly on Twitter, first on Thursday and then again on Saturday morning. Trump lambasted the retail giant for costing taxpayers “Billions of Dollars” with its special deal with the US Post Office, and ripped the company for “pay[ing] little or no taxes to state and local governments.” The series of tweets aren’t the first time Trump has gone after Amazon, and Axios reported on Wednesday that the President is looking for ways to go after the company with antitrust laws. Trump even went so far as to suggest that the Washington Post, which is owned by Amazon CEO Jeff Bezos, should register as a lobbyist. As a result of the Axios report, shares of Amazon fell almost 5% on Wednesday. The Commerce Department announced that GDP growth in Q4 of 2017 was 2.9%, higher than the previously-announced figure of 2.5%. The figure is a slight dip from Q3’s annualized growth rate of 3.2%, and the revision comes as forecasts for Q1 of 2018 have markedly declined since February. The Atlanta Fed had projected back in February that annualized Q1 growth would be a blistering 5.4%, but has since lowered their projection all the way down to 1.8%. UBS is projecting an even lower growth rate of 1.4%. For comparison, annualized GDP growth in Q1 of 2017 was 2%. In a shortened week due to markets being closed on Good Friday, US benchmarks logged an up and down week. 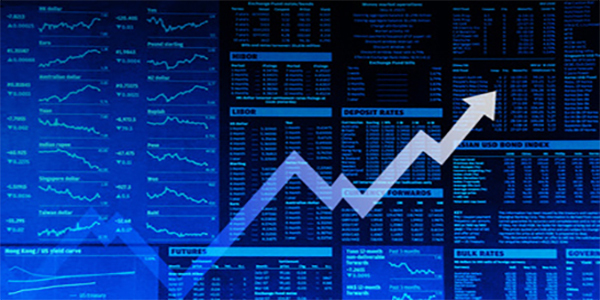 The Dow Jones Industrial Average (DJIA) finished up 2.7% for the week, the Nasdaq Composite (COMP) closed up 1.0%, and the S&P 500 (SPX) finished down 2.1%. European benchmarks fared about as well.The UK’s FTSE 100 Index (FTSE) finished up 1.7%, and the German DAX Index (DAX) closed up 1.5%. Asian markets were a mixed bag, with some benchmarks performing better than others. Japan’s Nikkei 225 finished up 4.8%. India’s BSE Sensex finished up 1.0% and Hong Kong’s Hang Seng closed down 0.6%. The “Trump Bump” seems to have run its course. Although world markets took a beating on Election Night 2016, since then, markets have gone nowhere but up. The Dow rocketed up 25.1% in 2017, hitting its all-time high of 26,616.71 on January 26th, 2018. GDP growth rose from 1.5% in 2016 to 2.3% in 2017, and the number of weekly unemployment claims in February hit its lowest level since 1969. The Tax Cuts and Jobs Act (TCJA) passed in December of last year continued to propel markets and the economy to new heights. But the euphoria that characterized 2017 seems to have evaporated in 2018, and President Trump’s agenda has gone from an economic catalyst to an inhibitor. While markets no longer react to his tweets the way they used – at least not as drastically – its the White House agenda that has started to act as a drag on markets and the economy. Most notably, neither China nor the US seem intent on backing down in their latest trade confrontation. A CNBC survey in March found that the trade war threat is Wall Street’s top economic concern, and Gavyn Davies of the Financial Times noted that a global trade war would result in a negative shock of 1-3% to world GDP over the next couple years. With US Trade Representative Robert Lighthizer set to unveil the Trump administration’s latest tariff targets this week, the conflict doesn’t appear to have an end in sight, at least in the near future. Even outside trade disputes, inflation has also returned as an economic concern. Core PCE, the Fed’s preferred inflation measure, rose 1.6% year-over-year in February, the largest increase since April 2017. With stimulus from the TCJA and the latest discretionary spending bill set to go into effect this year, some officials at the Fed have become concerned about the potential for higher inflation. On top of all of that, corporate and government debt levels continue to reach staggering heights. In February, S&P warned that high levels of corporate debt could lead to a rise in the default rate as interest rates rise. The proportion of highly leveraged corporations hit its highest level since the 2008 financial crisis. On the government side, neither Congress nor the White House seem interested in curbing government spending, even as the national debt exceeded $21 trillion in March. With the economic picture looking increasingly clouded, expect the once-rosy forecasts for 2018 to continue to be revised downward. Tesla is on the ropes – and there’s little hope in sight. While investors have cut Tesla some slack due to the “Elon Musk Effect,” it seems that his personality cult of investors is slowly eroding. Last week’s confluence of bad news may have been an aberration, but it’s not the NTSB or a recall that has the potential to bankrupt the company: it’s a cash crunch. Although the Model X crash in California seemed to get the most attention from the media, Moody’s downgrade of Tesla’s credit rating has far more important – and dangerous – implications for the electric car maker. Tesla currently has $3.4 billion in cash and securities on hand, but the company had a negative free cash flow of $4.14 billion in 2017, which is why Moody’s noted the company doesn’t have enough liquid capital on hand to cover its normal operations and productions expenses this year. The company also has to start making payments to bondholders starting this year, which will cost the company $1.2 billion in total. Tesla essentially has two options for avoiding bankruptcy: ramp up Model 3 production, or raise more cash. Clearly the former is a better option than the latter, but things aren’t looking good on that front. While Musk has set a production goal of 5,000 Model 3’s per week by the end of June, he has said that the near-term goal is half that. Based on informal tracking by Model 3 fans, production may not even reach that number. One measure estimates Model 3 production at 877 per week, while another has it at 1,533 per week. Tesla is set to release Q1 production data on Monday, so investors will find out very soon if Tesla has managed to even come close to their production goals. In terms of raising money, Tesla can issue either bonds or new equity shares. Moody’s downgrade will make issuing bonds even more expensive for the company; while Tesla was previously able to issue bonds at a 5.3% coupon rate, due to the downgrade and rising interest rates, bond analysts expect Tesla to have to offer a significantly higher rate. On the other hand, issuing new equity means that Tesla’s already beleaguered stock will fall even further. Considering that Musk’s compensation package is closely tied to Tesla’s market cap, this might not be a route Musk wants to go down. All of this doesn’t even include the fact that a number of automakers that have been held back by corporate inertia are starting to move into the electric car space that was once Tesla’s niche. Volkswagen recently announced that it was buying $25 billion in batteries for electric cars, and by 2025, the company would be producing 3 million electric vehicles (by 2030, Volkswagen hopes to electrify all of its brands). Investors are also starting to bet against Tesla; the stock’s short interest ratio (SIR) is up to 22.56%. Time and money are running out for Tesla, and recovering from its current mess will require near-perfect financial management and a stroke of genius from Musk (which, in all fairness to him, isn’t all that improbable). Don’t expect cryptocurrencies to fare any better in Q2. The first quarter of 2018 was a bloodbath for cryptocurrency investors. Bitcoin, arguably the most popular and iconic crypto, has fallen over 70% from its all-time high of $19,694.69 in December of 2017. The broader cryptocurrency market has mirrored Bitcoin’s plunge, with the total value of all cryptocurrencies plummeting from $618 billion to below $300 billion. The top ten cryptocurrencies by market cap suffered Q1 losses that ranged from 24.9% to 77.7%. Most analysts at banks have wisely turned bearish on cryptocurrencies, with the head of Goldman Sachs’s research unit predicting that most cryptocurrencies would be gone in the next five to ten years. Some, however, remain as bullish as ever. Investor Tyler Winklevoss claimed Bitcoin would eventually hit $320,000. Fundstrat’s Thomas Lee has maintained his year-end price target of $25,000. It seems that the cryptocurrency euphoria has started to fade, and the Bitcoin collapse has reflected that. On the fundamental side, things aren’t looking good either. The EU on Friday slashed leverage limits on cryptocurrency trading by retail investors, sending Bitcoin below $6,000 at one point, and European and Asian regulators are looking to create a uniform legal framework for cryptocurrency trading. The Bitcoin bubble has popped, and there seems to be little reason to believe there will be any positive developments for the crypto market in Q2.